JK Controls has about 100 man years of experience in industrial control systems, instrumentation and process control system design and realization. Most of this experience has been obtained in the power generation industry and steam related industries. With the advance in technology over recent years this knowledge has been extended to encompass distributed control systems from many manufacturers. As system integrators every project is designed to our customer needs and is therefore unique. Consequently we can only give examples of previous projects as a guide to our wide field of experience and capability. Our automation engineers have designed the automatic control system for a major generating plant on behalf of a plant contractor. Full advantage has been taken of the Distributed Control Systems technology to reduce operating staff and improve the quality of control and the flexibility of the plant. We have supported main plant constructors by designing DCS based Burner Management Systems for oil, gas and coal firing. We have taken on the design, procurement and implementation of the whole C&I scheme for a power station relocation to Malaysia. We have also provided remote control of 400kV grid system switchgear using a SCADA system and programmable logic controllers (PLCs). For small systems we make use of Human Machine Interface (HMI) equipment for use with programmable logic controllers (PLC), for example, river level control with active weirs for the Environment Agency and crash test rig controls for a transport research company. Clicking on the image to the left will download an executable file that will run an interactive demo of a realistic simple non-linear SCADA system. 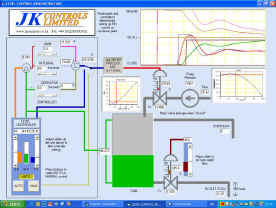 You can adjust the plant conditions and controller settings and observe the responses in graphical form. Note: some virus protectors may require you to 'accept' the download of this executable file.